Looking for DVD Replication for your next DVD project? Discus Group are one of the UK’s leading independent companies in DVD replication, manufacturing thousands of DVDs per day. 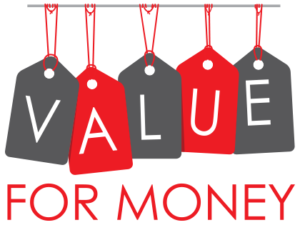 We offer standard and fast turnarounds, a flexible approach to your project and cheap DVD prices. 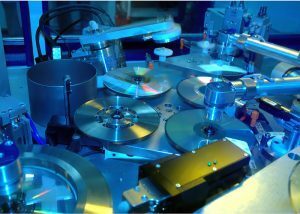 DVD duplication is the ideal process for producing small runs of DVDs fast in a cost effective way. At the heart of Discus Group is the customer service ethos. Every order no matter how large is small is treated equally. Our flexible approach bespoke in house production systems enable us to tailor our services to our clients individual requirements. 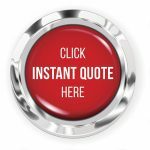 For a quick online DVD Replication quote click the quote button on the right. I Need DVDs replicated quickly? 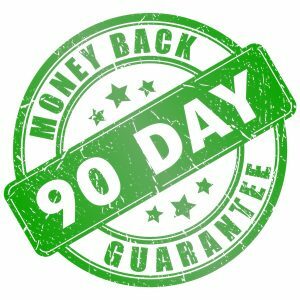 Subject to deadlines for projects we already have in production we may be able to offer fast DVD replication with certain packaging options. 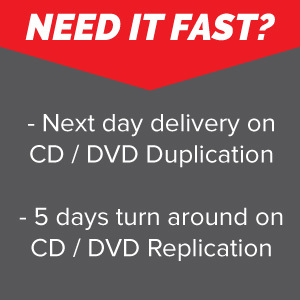 With our I Need Speed Service we can offer fast DVD replication projects in as little as 5 days depending on our existing work load and your packaging type. Our replication department uses the latest state of the art robots DVD pressing line, DVD printers and packing machines, Virgin polycarbonate and highest quality retail grade cases. This together with our automated bespoke built systems, ISO9001 and over 20 years expertise our procedures ensure we manufacture consistent professional quality DVDs of the highest standard within the industry. All this ensures you get quality replicated DVD discs every time. There are 4 different versions of DVD each has a different capacity and layer make up. Single sided DVD (DVD5 and DVD9) can be printed fully on one side only. Double sided DVD (DVD10 and DVD18) only have a small area on each side of the disc around the centre hole which can be printed. The full face of a dual layer DVD cannot be printed as both sides of the disc are used to read the data. On dual layer discs both layers of the disc are read without taking the disc out of the player. The laser is able to read the first layer and then adjust focus to read the second layer automatically. Double sided discs manually have to be taken out of the DVD player and the disc turned over for the second side to be read. DVDs are replicated in a very similar way to CDs. There is one main difference between DVD replication and CD replication. When DVDs are replicated two discs are produced and these are then bonded together. Even for a single layer, single sided DVD5 two discs are produced. A layer containing pits and lands is bonded to a second dummy layer with no pits and lands. On Dual layer discs the laser must reflect off the 1st reflective surface and then re-focus and read through the first reflective layer to the second. The first reflective layer therefore has to be semi-reflective. The semi-reflective layer is made from gold, silver or silicon and the reflective layer is aluminium. When authoring a dual layer DVD Video the position of the layer break is very important. The mastering process will pick up if the layer break is not set at the correct point and a new master would need to be supplied. The layer break should split the content into 2 equal layers. There is some tolerance for the positioning either side of the mid point which allows the break to be placed in a position to minimise the viability of the layer change. Its important to note that not all software will let you choose where to position the layer break and can place it in the incorrect area. Even if you have set the layer break in authoring software some burning software can overwrite the position.